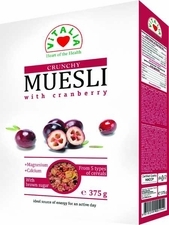 Vitalia Crunchy Muesli are mixed grain cereals (wheat, rye, and oats), all containing a different combination of dried fruit and nuts. Crunchy muesli is sweetened with unrefined brown sugar. 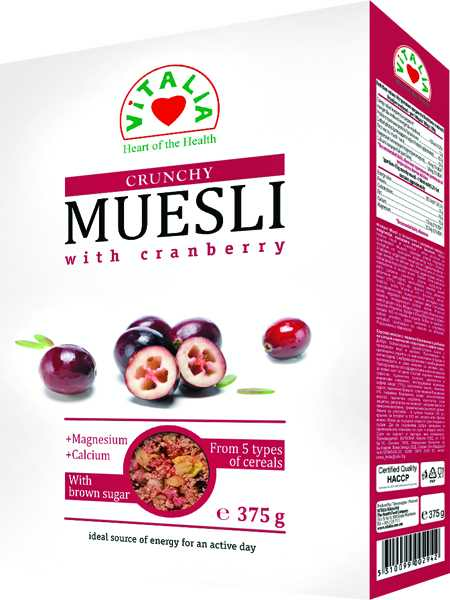 High in vitamins and nutrients, the health benefits of muesli are accelerated when used as a breakfast cereal with milk or as a snack, mixing the muesli in with low-fat yogurt. © 2013 Fast-Pak Trading, Inc. All rights reserved.